Like many other things around the time of the Industrial Revolution, the process of producing cement and concrete took many leaps forward in the 1800s. As early as 1793, John Smeaton discovered a modern method for producing hydraulic lime for cement by using limestone containing clay that was fired in a kiln. The resulting stone-like products called “clinker” were then ground into a fine cement powder. This produced a steady and consistent supply of cement that could be shipped to construction locations and mixed with other local ingredients to form concrete for special or unique structures. In 1824, an Englishman named Joseph Aspdin took this process a step further by burning finely ground chalk and clay in a kiln until the carbon dioxide was removed. 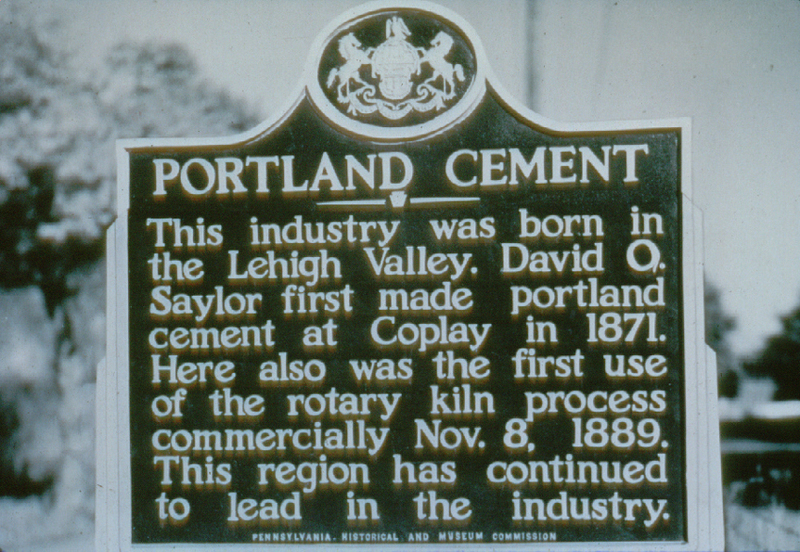 The resulting product was named “portland” cement because it resembled the light-colored, high-quality building stones found in Portland, England. Portland cement was first developed in England and became popular in the United States in the late 1800s with advances in its production. It soon became apparent that some engineering was needed to ascertain the true structural properties of different cement and concrete products. Between 1835 and 1850, systematic tests to determine the compressive and tensile strength of cement were first performed, along with the first accurate chemical analyses. By 1860, portland cements of modern composition were produced and manufactured to detailed standards important to the hydration process and the chemical characteristics of the cement. These standards were based on heating a mixture of limestone and clay in a kiln to temperatures between 1,300 degrees Fahrenheit and 1,500 degrees Fahrenheit. In 1885 came the development of a horizontal, slightly tilted kiln that could rotate the cement ingredients and function more efficiently. This rotary kiln provided better temperature control and did a better job of mixing materials so much so that by 1890, rotary kilns dominated the market. The other significant advance during this time was the evolution of steel products. It didn’t take long to realize that combining concrete with steel reinforcing bars would allow the best of both worlds: the compressive strength of concrete and the tensile strength of steel. By the late 1870s, the first steel-reinforced concrete buildings came into existence and have been a common structural system ever since. However, despite all of these advances, concrete during this time was still seen as a utilitarian material to be used for mostly industrial and infrastructure projects. As ACI and PCA resources became better known and the industrialization focus of the 1800s passed to the more vision-focused modern movement in the 1900s, reinforced concrete started to become a material of choice by well-known architects who used it for many notable buildings. Not only did it provide the ability to create a fire-proof structure, but air-entraining agents and other chemical admixtures that were developed in the 1930s increased resistance to freezing and improved workability. These attributes solved a number of technical issues, but the plastic, malleable qualities of poured-in-place concrete offered exciting new design possibilities, too. Architects could begin to investigate concrete forms that could either be cubist and rectilinear or free flowing and expressive of nature. Increasing expertise with reinforced concrete allowed thin shell construction, which employed thinner concrete slabs and shapes than previously. New forms, such as parabolic arches and hyperbolic paraboloid roof structures, began to be used. The Sydney Opera House in Sydney, Australia, became a mid-century poster child for the artistic use of concrete formed into segments of spheres to produce a dramatic structure that appeared light and airy, like sails on a ship. Other structures like Saarinen’s Washington Dulles International Airport and TWA Flight Center at John F. Kennedy International Airport became equally iconic in the United States. Today, we are the beneficiaries of all of the past exploration, technical development, and creative experimentation by associations, design professionals, and construction companies that have worked with concrete. Further refinements into materials research, engineering, and the science of concrete combined with new design methods and technology have allowed architects to demonstrate innovative and exciting new capabilities. We will look at a few of those recent developments here. The PCA points out that the key to achieving a strong, durable concrete rests in the careful proportioning and mixing of the ingredients. A mixture that does not have enough cement paste to fill all the voids between the aggregates will be difficult to place, produce rough surfaces, and will be porous. A mixture with an excess of cement paste will be easy to place and will produce a smooth surface; however, the resulting concrete is not usually cost effective and can more easily crack. Concrete is commonly defined structurally in terms of its compressive strength. Because it is custom mixed and subject to human variation, it is routine to require test cylinders to be pulled from each mix or batch that is used in a building. In order to obtain a determination of actual strength, measured cylinders can be filled and allowed to cure up to 28 days. At that point, the cylinders are removed from around the concrete and hydraulic testing equipment can be used to determine how much pressure the concrete can withstand before breaking or otherwise failing. The combination of engineering and years of test results have allowed those who specialize in concrete mixing and production techniques to gain a good understanding of how to formulate the mixtures to accurately predict the strength of cured concrete and design accordingly. The common, medium-strength concrete used in a lot of building construction is usually specified to withstand about 4,000 pounds per square inch (psi) of pressure. Some installations where strength is less important can be approximately of 2,000 to 3,000 psi, while concrete that needs to be more durable and may be thinner (such as sidewalks) is usually on the order of 5,000 to 6,000 psi. 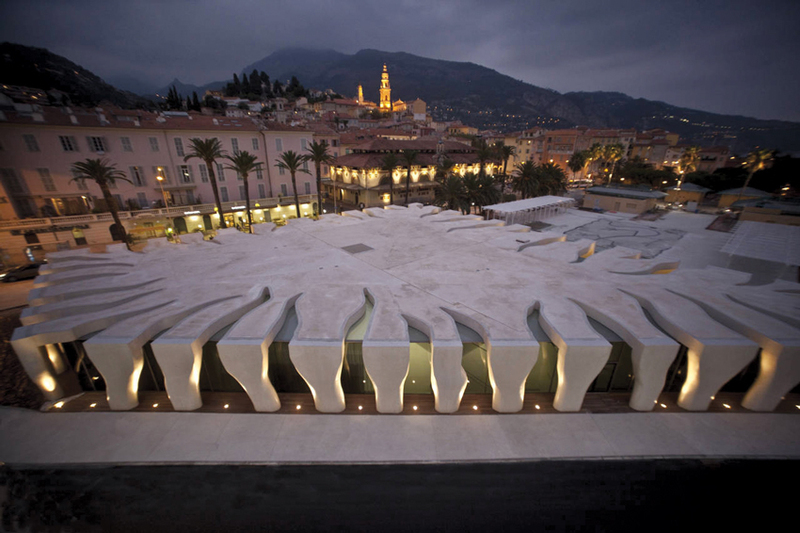 At the Musée Jean Cocteau – Collection Severin Wunderman in Menton, France, (2007), concrete is used to establish a rectilinear enclosure with a curved and flowing design expression. In recent times, the question has been raised about whether or not concrete of even higher strengths than these are possible. During the past two decades, researchers and engineers have worked with the chemistry of cement and concrete to answer that question with a resounding yes by developing mixes that yield higher strengths than previously typical. Although there is no precise point of separation between high-strength concrete and normal-strength concrete, ACI has defined any concrete with a compressive strength above 6,000 psi to be termed high-strength concrete. Those engaged in the development of high-strength concrete were influenced by experts from the early 1970s who predicted that the practical compressive strength limit of ready-mixed concrete would unlikely be able to exceed 11,000 psi. However, modern development and testing have achieved compressive strengths of up to 12,000+ psi with two buildings in Seattle, containing concrete with a compressive strength of an incredible 19,000 psi. The manufacture of high-strength concrete involves making optimal use of the basic ingredients that constitute normal-strength concrete. Those who produce it have learned the specific factors that affect compressive strength and how to manipulate those factors to achieve greater strength. In addition to selecting a high-quality portland cement, they optimize aggregates, then optimize the combination of materials by varying the proportions of cement, water, aggregates, and admixtures. For example, when selecting aggregates for high-strength concrete, the inherent strength and optimum size of different aggregates are considered. In looking at the bond between the cement paste and the aggregates, the surface characteristics of the aggregate as well as the characteristics of the cement are considered. Any of these properties could enhance or limit the final capabilities of high-strength concrete. Taking things up to an even higher level, ultra-high-performance concrete (UHPC), also known as reactive powder concrete (RPC), has been developed as a high-strength, ductile material. The material provides compressive strengths up to an astounding 29,000 psi but also provides flexural strengths up to 7,000 psi. The flexural or ductile behavior of this material is a new first for concrete—concrete has not previously had the ready capacity to deform and support flexural and tensile loads. Normally, rock and concrete respond to structural stress either by breaking or bending. When rock or concrete breaks, it is called brittle deformation since any material that breaks into pieces exhibits brittle behavior. When rock or concrete actually bends or flows, it is called ductile deformation, meaning the material deforms but stays intact. We normally think of metals, such as steel, deforming in this way so the ability of UHPC to do this is unique to concrete construction. It is formulated by combining portland cement, silica fume, quartz flour, fine silica sand, a high-range water reducer, water, and steel or organic fibers. Using this material for construction becomes simplified since reinforcing steel may be able to be eliminated. It may, in some cases, be dry cast or self-placed with minimal use of formwork. UHPC also exhibits superior durability characteristics due to a combination of fine powders selected for their grain size (maximum 600 micrometer) and chemical reactivity. The net effect is a maximum compactness and a small, disconnected pore structure. 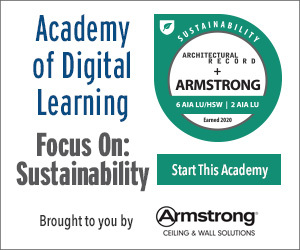 What does this mean for building design? High-strength and ultra-high-performance concrete provide new possibilities for high-rise buildings and other structures where greater strength and thinner profiles (i.e., less weight) are important. This newly available combination of superior properties and design flexibility can facilitate the architect’s ability to create attractive flat, curved, or multidimensional shapes. It can also offer solutions with advantages like speed of construction, improved aesthetics, superior durability, and impermeability against corrosion, abrasion, and impact, which can mean reduced maintenance and a longer life span for the structure.